"Helping People Embrace Change & Discover Financial Independence." 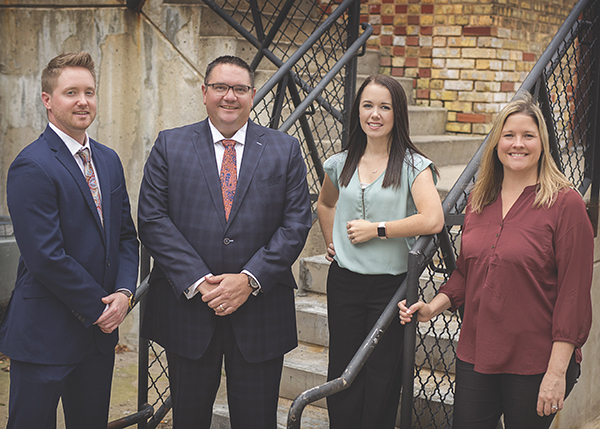 Front Row: Andrew Keister, Director of Retirement Plans; Matthew Krueger, Financial Advisor; Rachael Bennett, Director of Insurance & Investment Operations; Jodie Norman, Director of Marketing and Client Services. “My value proposition is to be a coach and catalyst for my clients. My main focus is to help clients develop a vision for their personal, professional, and financial goals. I enjoy learning about their passions in life and helping them overcome any fears that could derail them from attaining their financial goals. My team and I strive to provide top of the line financial planning and client servicing. We work with many community professionals including doctors, dentists, accountants, and attorneys. We also work with family business owners on creating an overall risk and financial plan for their personal and business needs, including assisting in their business succession planning. My team and I specialize in working with individuals who are five years from retirement or are in retirement. With our expert guidance and the strength of Northwestern Mutual, we are able to assist our clients with all of their financial planning needs."